Photo(s) by Emma WinowieckoAcres of lavender, a picnic hill, berry patches and a farmhouse-style gift shop invite visitors to spend an afternoon at the Secret Garden at Brys Estate. A winding dirt road passes through a cluster of trees revealing a lavender-lined lane and a valley surrounded by woods and grape vines. This magical spot is home to the newly opened Secret Garden at Brys Estate Vineyard & Winery in Traverse City. Acres of lavender, a hilltop picnic area, berry patches and a farmhouse-style gift shop invite visitors to spend an afternoon at the charming Old Mission Peninsula garden. Wander among 12 acres filled with more than 5,000 Old Mission lavender plants in this MyNorth Media video. The Secret Garden has been in the works for three years, the time it takes for lavender plants to produce a good harvest. The idea came from Brys’ founders Walt and Eileen’s visit to Provence, France where vineyards and fields of lavender are often paired. “We want people to come here and feel inspired,” says Katie Brys Elmasri, who helped make her parent’s idea a reality. It’s hard not to feel inspired. Fields of flowers, a herb garden, stunning views of the vineyard and a horse pasture; the property is enchanting. “We call it a secret because you can’t see it from the road or anywhere on the property,” Katie says. The seclusion certainly adds to the intimacy of the garden. Inside the gift shop, 90 percent of the products are handmade, Katie says, and many are made with repurposed materials. The quaint shop carries kitchen and bath products along with items for pets, children and adults. Lavender lotions, tooth fairy pillows, smores kits, vintage vases, lavender baby mobiles and more fill the shelves. Visitors are welcome to peruse the bookshelf filled with a collection of vintage books and read for a while on the couch. Or head outside to the wraparound porch and relax with a cold drink to enjoy views of the gardens. 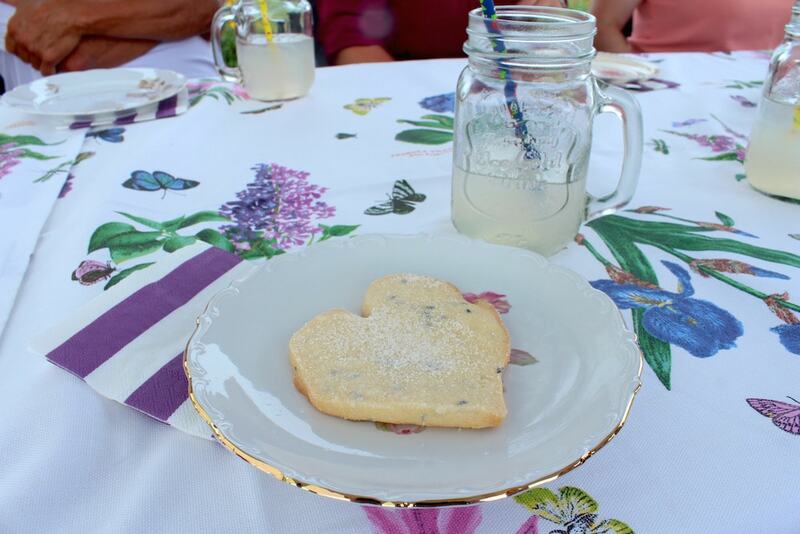 Blueberry ice tea and lavender lemonade are available at the gift shop for picnickers along with homemade cookies such as lavender shortbread and blueberry, white chocolate and lemon. Working with lavender and fruit grown in the garden, Moomers created four custom ice cream flavors including lavender lemon with white chocolate chips and vanilla swirled with pinot noir jam, which are available for sale in single servings. Pack a picnic, pick a basket of berries, create a bouquet with fresh flowers and enjoy homemade treats among the fragrant fields of lavender. It’s an experience you won’t forget. The Secret Garden at Brys Estate is open daily June through October. Hours: Monday through Saturday, 11 a.m. to 7 p.m., and Sunday 11 a.m. to 6 p.m. The Secret Garden at Brys Estate is located at 3309 Blue Water Rd. Call 231.223.4235 for more information.